WhatsApp is reportedly working on a new data privacy option in line with the European Union’s proposed General Data Protection Regulation (GDPR). The GDPR which is set to become effective from May 25 this year will harmonise the data privacy laws, and the Facebook-owned WhatsApp is set to revamp its data privacy option. In the latest WhatsApp Beta 2.18.50 update submitted by the company to Google Play Beta program, it is revealed that WhatsApp has already started working on the new data privacy option which will be effective on all the Facebook platforms before May 25. “WhatsApp has submitted a new update through the Google Play Beta Programme, bringing the version up to 2.18.50. A new GDPR privacy option is under development that will also affect the Facebook family of companies,” reported the popular WhatsApp watcher WABetaInfo. Once the new data privacy option comes into effect, users will be able to download a report of their data by heading over ‘Account’ Settings. 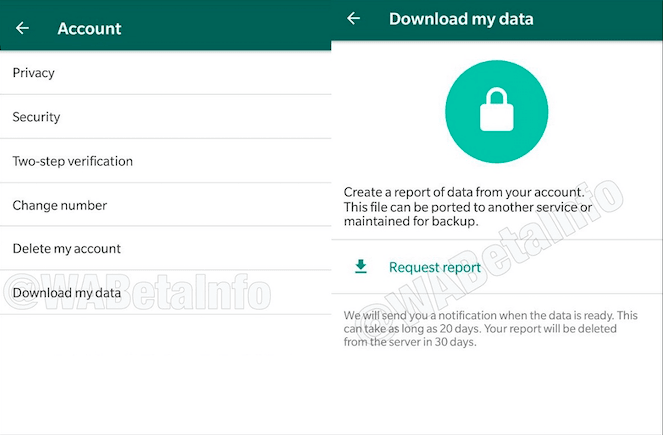 Under the Account settings in WhatsApp, there will be a new icon ‘Download my Data,’ which by clicking will ask you to create a report of data from your account. “Create a report of data from your account. This file can be ported to another service or maintained for backup,” added the instructions the new feature screen. And once the report is ready, WhatsApp will notify users. “We will send you a notification when the data is ready. This can take as long as 20 days. Your report will be deleted from the server in 30 days,” further added the instructions. As stated, WhatsApp has just begun testing this new feature, and it will go official to users before May 25. Back in August 2016, WhatsApp said that it would be sharing the data of users with its parent company Facebook, which created a lot of buzz on the web. And Government’s across various countries immediately asked WhatsApp to stop sharing the data. Supreme Court of India has asked WhatsApp and Facebook to state whether the data is being shared with a third-party entity or not.